Macau casinos earned a whopping MOP 360.75b (US $45.2b) in 2013, an 18.6% improvement over 2012’s total haul of MOP 304b. The growth also eclipsed 2012’s rate of 14% and beat virtually all analysts’ predictions, most of which had suggested something in the 12-15% range. The bounty was also achieved despite the year starting with rampant rumors of a crackdown on junket operators on the Chinese mainland, reportedly due to new Party leader Xi Jinping’s vow to stamp out corruption amid China’s political and business elites. Macau casinos capped off the year with a $4.2b take in the month of December, up 18.5% over the same month a year earlier. That’s around $350m shy of October’s record monthly tally, but still represents two-thirds of the total $6.2b earned by Las Vegas Strip casinos in all of 2012. 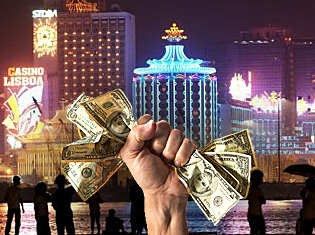 Strip casino revenue is projected to grow only around 4% in 2013 when final numbers are released at the end of January, meaning Macau is now earning roughly seven times what Vegas takes in on an annual basis. Leaving out tribal casinos, the entire US commercial casino biz generated just $37b in 2012, about $1b shy of what Macau earned that year. Macau’s good times are expected to continue as casinos brace for the annual invasion of Lunar New Year revelers. But no new casinos are scheduled to open their doors in 2014, which could make sustaining the current growth rate a dicey proposition. Then again, recent infrastructure upgrades on the mainland will allow increased visitation, as evidenced by November’s 1.56m arrivals from the mainland, the highest influx in any November for six years and Macau International Airport traffic rose 11% to 5m passengers in 2013. Macau’s non-gaming options will also get a serious boost via the overdue opening of the Chimelong Ocean Kingdom theme park on neighboring Hengqin island in January, the first phase of a project that will ultimately add nearly 2k hotel rooms to Macau’s total. Union Gaming analyst Grant Govertsen suggested Hengqin’s theme park could draw between 1m-2m visitors – 70% of whom would be of legal gambling age – in its first year of operation. Some analysts are suggesting that China’s late-2013 vow to loosen restrictions on money movement could negatively impact Macau’s VIP market, which relies on junket operators to front sums of money that gamblers aren’t currently allowed to take out of the country. But even if capital controls are loosened, it would likely offer a boost to Macau’s ‘premium mass’ market, which was already nibbling away at the dominant VIP sector. Given that premium mass gambling cuts out the middlemen and thus allows the casinos to keep a significantly greater slice of the pie, Macau casinos aren’t likely to protest too strongly.